Hoping to give his children, Rusty and Linda, two months of healthy country air, Danny Williams and his wife Kathy rent the Ricardos' Connecticut home while Lucy and Ricky are to be in Hollywood making a motion picture. On their arrival in New England, the Williamses discover that the Ricardos' film commitment has been canceled and they want their house back. Danny holds firm, however, and the Ricardos wind up "bunking in" with the Mertzes. Lucy cannot stand the thought of "strangers" living in her house, using her best dishes for every day, not watering her plants, etc., and makes a nuisance of herself by dropping in every two or three minutes to check up on things. Tempers soon flare, and the housing problem culiminates in a six-way snowball fight and a day in court, where a bewildered judge tries to smooth out the badly wrinkled domestic situation. 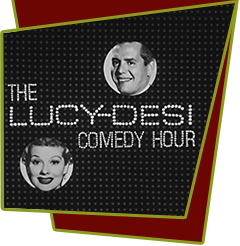 Special Notes: Danny Thomas's 'Make Room for Daddy' series inherited the 'I Love Lucy' time slot, Monday Nights at nine, when the half-hour sitcom went off the air in 1957. When Thomas originally agreed to do his series for the fall of 1953 (for ABC), he went to Desilu for production assistance and utilized their exclusive three-camera technique. Desi Arnaz had been trying to get Danny Thomas on the 'Lucy' show since 1955, but, at that time, there existed a sponsor conflict, 'Make Room for 'Daddy' was being sponsored by a competing cigarette company. Bloopers: At the episode's conclusion, when the cast is in court, Little Ricky is shown sitting behind Ricky and Danny; but in the next scene, he is sitting behind Fred and Ethel.